In the summer of 2016, I was part of a team that formed through Blue Ridge Labs @ Robin Hood Foundation’s Fellowship program. We built an online tool called Daisy Debt to help low income New Yorkers deal with illegal debt collection practices. This article summarizes five key takeaways and opportunities in building technology solutions to address consumer debt based on my experiences creating the Daisy Debt tool. During our user research we talked to more than 30 New Yorkers with low incomes about their financial lives. Many were not working or were underemployed with part time work, and their only other sources of income were social security, public assistance or food stamps, and occasional help from family. People told us about the strategies they used to stretch their incomes as far as possible – even though it was still not enough to cover basic expenses. As Sendhil Mullainathan and Eldar Shafir discuss in their book “Scarcity: Why Having Too Little Means So Much,” people’s minds work differently when they lack something. This “scarcity mindset” has two effects: it focuses the mind on acute needs and at the same time narrows a person’s perspective and creating tunnel vision. We observed this lack of scarcity mindset at work with our participants. Given this mindset, it’s not surprising that people used credit cards and extra student loan funds to pay for immediate needs and in the process accumulated more debt. They developed a default mode of ignoring debt collectors. Most participants had used enough mental bandwidth to deal with the acute need of stopping annoying communication from the debt collector by blocking phone calls and throwing away letters, and then moved on to other concerns – such as how to increase their income. They were engulfed by tunnel vision and did not have enough bandwidth to explore alternatives such as asserting their rights, even if it meant preserving the income that they already were getting. OPPORTUNITY #1: How might we support people who are tunneled on one way to deal with debt (earning more) and introduce alternatives such as asserting their legal rights? 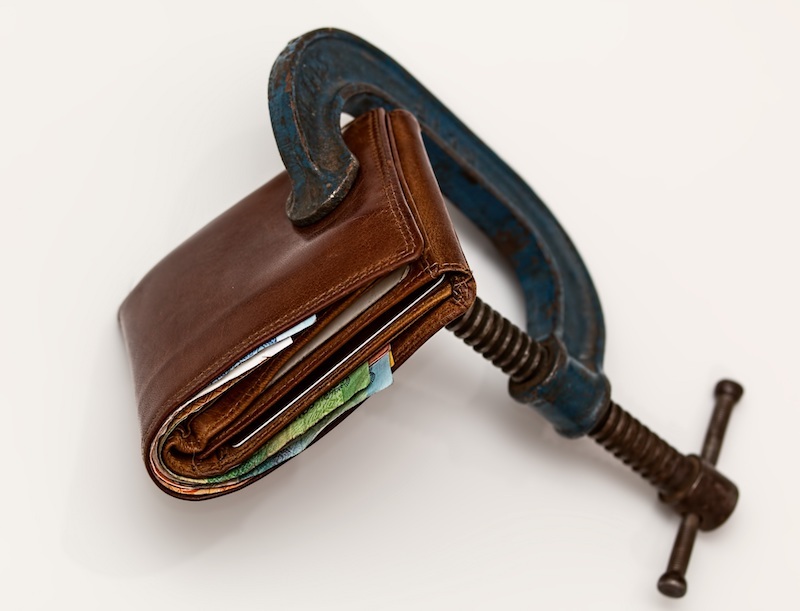 · Who is asking you to pay – the original creditor or a debt collector – or a scam artist? · Can you afford to pay any of the debt so can negotiate the sum you owe? · Do you have income that is exempt from collection? The answers to these questions will change the equation about what someone can, and should and should not do. Additionally, there are three main federal regulations that protect consumers with respect to debt: Fair Debt Collection Practices Act (FDCPA), Fair Credit Reporting Act (FCRA) and the Telephone Consumer Protection Act (TCPA). Then state laws may introduce their own unique differences. Given this lay of the land, the space is very intimidating, overwhelming, and highly individualized due to what the person’s situation is. OPPORTUNITY #2: How might we simplify and automate the process of dealing with debt? As of July 2016, the CFPB (Consumer Financial Protection Board) had handled about 250,000 debt collection complaints since 2011 – about 85,000 in 2015 alone (source). The current structure of the consumer debt space makes it relatively easy for bad actors to make money off of vulnerable people. One example is credit repair companies, who advertise on TV, in print, and online, promising to improve people’s credit scores. They charge fees of $100/month for services that people can do themselves such as sending dispute letters; they lure people in with the idea that if they just pay a monthly fee that everything will be taken care of. Participants in our user research were familiar with some of these firms and a few had engaged their services with disappointing results. Some blamed themselves for not being able to complete the company’s “program,” whereas they probably would have been better off using those monthly payments to negotiate a lower repayment amount from their creditors. For the good actors working in debt alleviation, it’s a challenge to compete with the bad actors. They cannot promise the radical improvements that the bad actors do, making them less attractive to consumers. They also have smaller profit margins and therefore smaller marketing budgets than the bad actors, and have fewer opportunities to reach out to those who need their services most. OPPORTUNITY #3: How might we better compete with and stand out from scammy competitors to get people’s attention? We originally thought we could move faster by reaching out directly to consumers with a tool that they could use on their own. However as mentioned in Takeaway #3, we learned that it was prohibitively expensive to advertise directly to consumers given the competition with for-profit bad actors. So we changed tactics, and approached nonprofit organizations who do financial coaching, about our tool. We demonstrated how it worked and shared evidence from user research that users found it “easy” and “simple to use.” Despite this, we found that some nonprofit organizations were reluctant to incorporate it into their workflow. Eventually we were able to identify supportive organizations who were excited to make their counselors’ more efficient by using our tool. We learned that having a solid product and good implementation was not enough; we also needed to also understand the mission and incentives of the potential partner organizations and to demonstrate how our product helps them further their mission in order to truly become a part of the nonprofit ecosystem. OPPORTUNITY #4: How might we partner with complementary organizations already working in the space to help them further their mission? There is a growing trend in technology in Big Data and analytics; the thinking goes that if you can measure and track a phenomenon, you can gain insight into how the system is working – or not working. In the consumer debt space, the FTC and CFPB have collected some information. For example the FTC 2013 Commission Report stated that 50% of debt collection efforts stop when consumers asked to verify the debt; notably this figure comes from self-reports from debt collection agencies, not from consumers. The CFPB maintains a database of complaints about many financial services, including debt collection agencies. While this database does provide a glimpse into when things go wrong, it only captures issues from those consumers who want some sort of resolution to their issue. So in terms of Big Data, there are slim pickings of available datasets. There is lots of consumer debt activity happening but it is not being measured or evaluated. The CFPB wants better data in order to understand what current policies are working and to enact better policies if needed. Nonprofits who work with consumers with debt issues want better data to know that they advice they dispense is actually helping people, and not just anecdotal stories. OPPORTUNITY #5: How might we collect data on relevant parts of the process and get it to the right players to act on it and to ensure the tools we build are effective and worthwhile? As we explore technology solutions around the legal issues involving consumer debt, I know we can find solutions that address these opportunities. We can make tools that support people who are experiencing tunnel vision by simplifying and automating their options: that we can partner with other organizations to stand out from the scammers; and use data to ensure that the tools we build are effective and worthwhile. Marianne Berkovich was a Blue Ridge Labs Fellow in 2016. Marianne Berkovich has more than 15 years experience as a qualitative user experience researcher and has helped teams at Google, Adobe, and Lockheed Martin build world class products.